This is a copy of the Kitesurfing FAQ originally developed by Hung Vu (with some contributions from Mark Frasier) for the Kitesurfing School web site. Who are selling kitesurfing equipment? What are the differences (advantages vs. disadvantages) between a 2-line and a 4-line kite? Can a kitesurf kite reef automatically as a windsurfing sail? Can I build my own kiteboard or convert an old surf or windsurfing board to a kiteboard? Kites originated in China thousands of years ago (two kite masters Kungshu P'an and Mo Zi flew kites as early as 478 BC) and have managed to remain unchanged until the modern time, when multiple line controllable kites were introduced by George Pocock in 1826. For the first time in history, instead of letting the wind fly the kite, a multiple line controllable kite flyer can actually pilot the kite on the sky. Click http://www.asahi-net.or.jp/~et3m-tkkw/history-table.html for a chronological table of kite history and http://www.asahi-net.or.jp/~et3m-tkkw/history.html for a bibliography related to history of kites. Buggies are traditional kite vehicles on land; however, the newer generation of land kiters start to use skateboard-like board for land kiting for more challenges. On parking lot pavement, they use standard skate board and on grass or hardpack sand, they use bigger boards with larger wheels (sometimes called a mountain board). Yes. You can use your kite to pull a boat. Peter Lynn has released a small boat for use with a kite. Check http://www.peterlynnkites.co.nz/ for a picture of the boat. You normally do not need any assistance to launch or land your kite unless you are in a crowded and busy beach with considerable shore break. 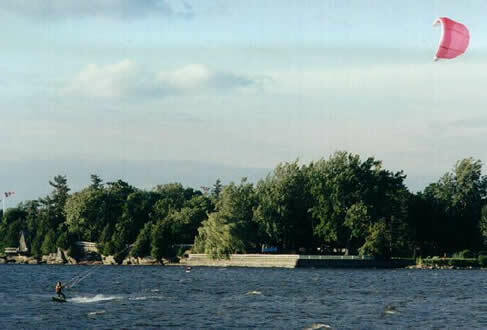 Different kites have different launching, landing and water relaunching techniques. Your vendor should be able to provide you with the appropriate instructions (if they cannot provide you with such information then for your safety and the safety of the others, do not purchase any kite from them). Check http://www.kitesurfingschool.org/howto.htm#1. Kite Piloting for information on launching and landing some of the most popular types of kite. 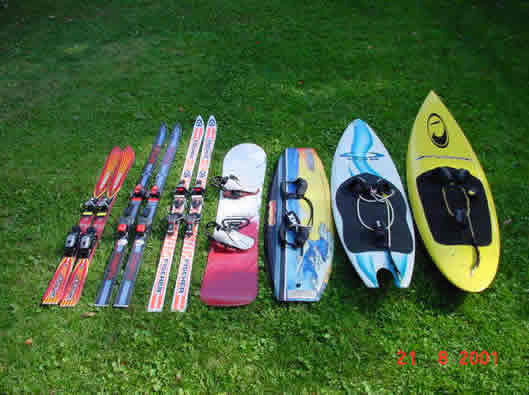 You can buy used kitesurfing equipment at http://www.kitesurfingschool.org/used.htm, http://www.iwindsurf.com/ and http://www.primoweb.com/kites/. You should learn kitesurfing from a reputable local kitesurfing school. If none is available in your area, you may want to travel to learn kitesurfing from one of the kitesurfing pioneers: Laurent Ness at http://www.axelair.com/. Click http://www.KitesurfingSchool.org/schools.htm to see a list of kitesurfing schools in the world. If you have to learn kitesurfing all by yourself, at least see some instructional video and/or take a look at the Kitesurfing School web site at http://www.kitesurfingschool.org/. The standard line length is 30m. As a beginner, however, you should use longer lines (30m to 40m). Longer lines create a larger wind window, therefore, have larger margins for pilot errors. Furthermore, use longer lines (40m) for faster kites such as ram air foil kites. In high wind, you should use shorter line length for more control of the kite; however, don't go shorter than 15 - 20 m as you will loose much of the jumpability of the kite and the ability to handle gusty wind. Many has built their boards (especially bidirectional boards) from wood very inexpensively. Check http://www.kitesurfingschool.org/board.htm and the boardbuilding group at http://groups.yahoo.com/boardbuilding for more information. Yes. There are a number of discussion groups on the net. Stefano Rosso has set up the original Kitesurfing discussion group on the net since June 1998 and since then it has been the most popular kitesurfing discussion group. You can find more information about this group by going to http://www.egroups.com/list/kitesurf. There is also a smaller discussion group dedicated for beginners learning the sport set up by Hung Vu since October 1999. You can find more information about this group by going to http://www.egroups.com/group/ksurfschool. If you prefer news group then try news:alt.sports.kitesurfing (send a request to you Internet Service Provider to request for this news group if they are not currently relaying it). There are also a number of more recent discussion group such as the Kite Forum created by Toby Braeuer and many other kitesurfing related groups. Click http://www.KitesurfingSchool.org/mlist.htm for the list of all known kitesurfing related groups.